A group of local students and city officials on Monday celebrated the completion of an infrastructure improvement project on Green Acres Road in midtown Fayetteville. 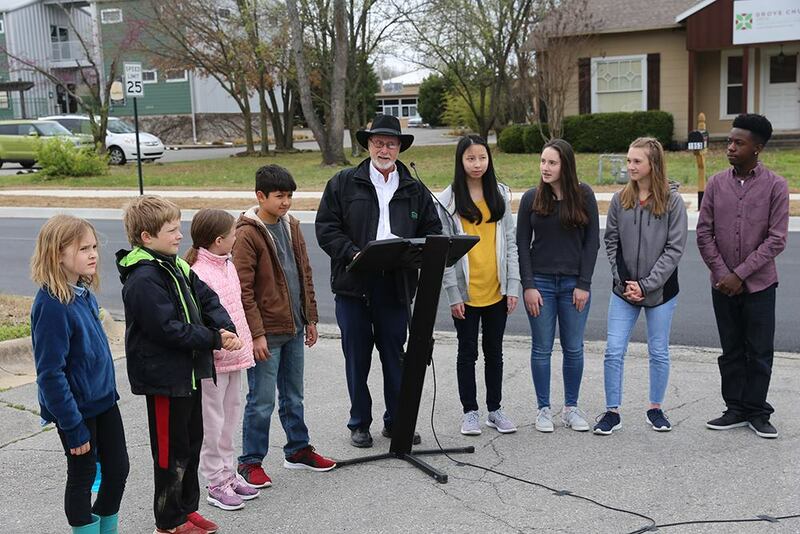 Mayor Lioneld Jordan was joined by students from Woodland Junior High School and Fayetteville Montessori Elementary School at a ribbon-cutting ceremony held near the corner of Green Acres Road and Poplar Street. The project was designed to create better access for the schools and businesses along the Green Acres corridor, and to add a safe walkway for students in the neighborhood. The work included building a 5-foot-wide sidewalk, curb with gutter, and underground storm drain piping along the west side of Green Acres from Colt Square to North College Avenue. The sidewalk will connect with future projects such as 71B Corridor Plan and the Sublett Creek Trail which proposed in question three of the 2019 Bond. Building important sidewalk connections near schools, residences, and businesses meets several goals in both the Fayetteville Mobility Plan and the Active Transportation Plan. The project was funded through the city’s Street Fund, which is financed through turn-back revenues from state motor fuel taxes and county road millage levies. For more information about the city’s sidewalk program, including 2019 projects, please visit fayetteville-ar.gov.